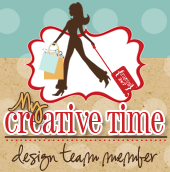 Welcome to Day Two of My Creative Time's 12 days of Christmas Blog Hop. If you came from Liz's blog, your are in the right place. Here is the line up in case you get lost along the way. Scalloped and Stitched Circle Die..instead of placing it on the top of the lollipop holder, I placed it on the bottom portion..It gave it a different look..There are so many ways to use this die! I (heart) it! These are going to make cute Christmas gifts! Make sure you stop by on day 12...I have a pretty cool project using this die. You do not want to miss it. Also, make sure you show some love to the other DT members..They did some amazing work! Thanks for stopping by. Big crafty hugs! Super cute! Great job as always. Looking forward to seeing what else you have created in the days ahead. Such a great idea.. I love how you've made something so child oriented magically transformed into something so classy! With the new fad in cake pops, I can see myself making TONS of these in my near future :) Thank you. WOW NANCY.... THIS TURNED OUT SOOOO BEAUTIFUL! I JUST LOVEY THE WHOLE CLASSY & VINTAGE LOOK OF IT!!!! AWESOME JOB MY FRIEND! As I've mentioned before, I love the lollipop holder die. Your paper is very pretty. Thanks for sharing. Super sweet idea, lovin all the great ideas. Cute treat holder, these are real popular. I love the treat holder. My SIL makes some awesome cake balls (cake pops without the stick) and I really thought about borrowing her recipe and making these! Hmmm...maybe she will do them for us for gifts instead. I may have to send her a hint! Nancy, the vintage feel to yoru lollypop gift is so nice. Great job! I love to be able to recreate a gift in minutes!!! I love this die, it is so versital! Your little favors are so cute!! I love how you used the stitched die at the bottom as well, looks great! super cute! the more i see these treatholders, the more i want them! great job! Cute lollipop holder! Love it...love the paper you used. So cute! I love that die! So pretty! I love the colors you used!!! Super cute idea. Love the colors. Very cute I love these ltitle lollipop holders. Great job. What a great project! I love the colors you picked. I just love this vintage look here! Great job Nancy! Beautiful! That crinkle ribbon is the perfect touch! Cute project! I gotta get this die-it is just adorable. I love the crinkle ribbon you used to! Great project! very cute papers and seam binding. Can't wait to use my die too. so cute! love the papers you used! what a great idea!! thanks for sharing! How darling is this!? I love the softness of the colors. So cute!! Super cute!! I just got that die and can't wait to use it this weekend. Your project is soooo adorable!!! I love it!! Very pretty, love the colors and the ribbon. I need to start using my lollipop holder, your look awesome, thanks for sharing. Oh the seam binding goes perfectly with that paper, fabulous!! Cute idea and love the seam binding! I just love this die...It makes the most adorable projects!! Nice job on your holder...I like that you put the circle lower and the paper looks vintage! Pretty! This die is a must have! love the soft papers you used!!! I love the lollipop holder it is super cute! I am so using this die on the weekend. beautiful! I am loving this die more and more! I just love seeing all the amazing ways the design team is using this lollipop die. Thanks for sharing your cute creation. So pretty! Just love the die more and more! Your lollipop holder turned out so pretty! Those darn cute lollypop holders get me every time. I love that die. Super cute. Cute lollipop holder - so many different ways to use that die!! Love your lollipop holder! So pretty! TFS!!! Your lollypop holder came out great! The Lollipop holder is really a fun one.. love the colors you used. You did such a good job. Thank you for sharing. super cute treat holder...thank you for sharing. Love the colors on your lollipop holders. Cute cute cute. I love the colors. These lollipop holders are awesome. Very nice! I LOVE that paper and the seam binding looks great! Your gift treat holder is too cute!! I love the vintage colors that you used! Great colors for that lollipop holders! So cute! Thank you for the inspiration! so cute lollipop holder. Love the color and paper design. Fabulous lollipop holder. Beautiful paper and ribbon. Yummy... in more ways than one! TFS! Cute! Glad she got more dies in. It's on my chritmas list. This is beautiful gift and I agree so many ways to use the die. I like the placement of the circle and ribbon. Great colors. Love your color combination-- very vintage! Thanks for sharing. really love the non-traditional colors on this!! Another cute project. I can't wait to use this die. I soo love this die cut. I really need to get a die cutting machine so that I can buy it lol. Very pretty. I love this die. Very nice little treat gift holder! Love the crinkle ribbon. I have been thinking of getting that die. This makes me want to get it! We will be doing lots of these in our Girl Scout troop. What a fab way to make gifts shine! Great idea!! Love the lollipop die!! Yummy, I want that die cut. These little treats a so cute! TFS!! Haven't tried one of these upright gift bags. Pretty cool! cool project! great favor or even stocking stuffer! I think this would be a great way to give out my cake pops! Great job and thanks for sharing! Oh, what a sweet sucker holder!! Thanks for the chance to win. Adorable! Who doesn't love a treat! TFS. I love this die!!! You did a great job on this! Adorable Lollipop Holder!! Love your projects!! Wonderful project - I love the look of those colours. TFS! Very nice--I like the papers and stamps you used. You did a great job on this!!! Really really cute, I love this die! That is a must have die!! Wow this is pretty. Great pick in paper! Awesome project, I so love this die. Very pretty....I LOVE those lollipop holders! If I'd stop blog hopping I'd have time to use mine!! Really cute. Thanks for sharing. So cute...these make such GREAT gifts!!! !